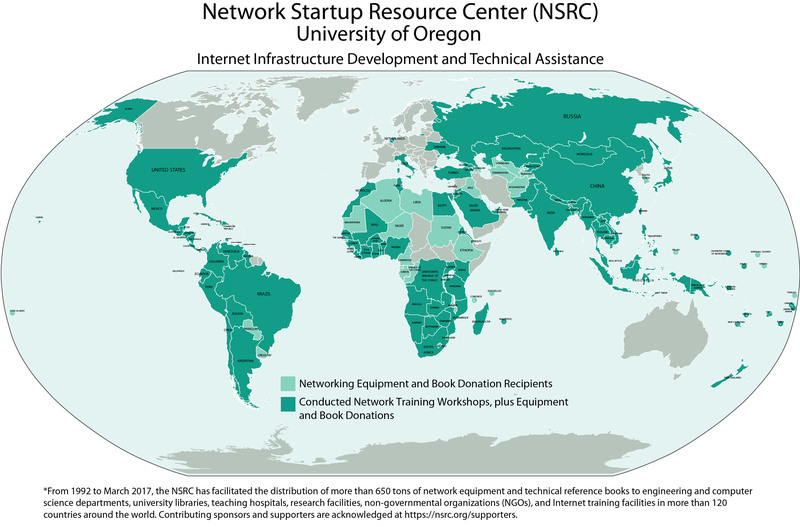 Established in 1992, the non-profit Network Startup Resource Center (NSRC), based at the University of Oregon, has provided technical assistance to universities, government agencies and other organizations to expand and improve Internet access around the world. One of the center’s main goals is to develop network communications infrastructure and local engineering capacity in developing regions of the world where inadequate connectivity poses a barrier to collaborations with U.S. scientists and educators. The NSRC will now be able to expand its influence thanks to a $3.7 million award from the National Science Foundation (No. 1451045), currently the largest active award from the NSF at the University of Oregon. The award to principal investigator Steve Huter, director of the NSRC, and co-principal investigators Dale Smith and Hervey Allen, will provide expanded support for the NSRC’s activities over the next five years. Huter was inducted to the Internet Hall of Fame in Hong Kong in April 2014 as a Global Connector, which recognizes individuals from around the world who have made significant contributions to the global growth and use of the Internet. Funded by an initial investment from the NSF, the NSRC has worked in more than 100 countries, often in collaboration with government leaders, university administrators and researchers. Through these partnerships, the NSRC has helped build some of the initial Internet infrastructure in Africa, Asia-Pacific, the Middle East, Latin America, the Caribbean, and North America. Last year, the center received a $3.2 million award from Google.org, a team at Google focused on social impact, to build cyberinfrastructure in Africa. Recently, the NSRC provided on-site engineering assistance to the Charles Darwin Research Station in the Galapagos Islands, part of the Charles Darwin Foundation and a NSF-funded research site. The islands are designated an UNESCO World Heritage Site for their significant biodiversity, geological activity, and historical significance as the birthplace of Darwin’s theory of evolution. The islands continue to be a location of important discoveries in biology, geology and atmospheric research. Engineers from the NSRC worked with the Charles Darwin Research Station to plan improvements to their existing Internet connectivity and communications infrastructure so visiting researchers, including U.S. scientists funded by the NSF, can more effectively collaborate with scientists around the world. Upgrades to the Charles Darwin Research Station and other improvements in international communications infrastructure support the research needs of organizations like the National Center for Atmospheric Research (NCAR), whose research mission requires scientists to work in remote regions of the world to share large sets of information in order to develop accurate models of large-scale weather systems. In addition to developing infrastructure to support research collaborations, a core part of the NSRC’s mission includes providing training and education to network engineers based in the countries where the NSRC is working, resulting in the development of stable computer networks, managed by local hands, in many countries all over the world. To address both human capacity and infrastructure improvements for the Galapagos Islands, the NSRC is providing funding for two Ecuadorian network technicians from the Charles Darwin Research Station to participate in a one-week training hosted in Manta, Ecuador with NSRC personnel from October 27-31, 2014. After completing the training workshop in network design, monitoring and management, the network technicians of the Charles Darwin Research Station will return home to lead the planned network upgrades. NSRC will arrange a shipment of network switches and wireless access points and send a team to assist the CDRF technicians with improving the Internet performance for visiting scientists. Both the NSRC and NCAR recently partnered with the Pacific Rim Application and Grid Middleware Assembly (PRAGMA) and Indiana University to enable more international science education through the development of network infrastructure in the Lower Mekong region of Cambodia, Laos, Myanmar, Thailand and Vietnam. The partners organized a weeklong workshop in Hanoi, Vietnam that brought together scientists who collaborate in several areas of science and engineering, including: water resource management, disaster recovery planning, climate change and forestry and their network support staff to work with U.S. scientists and network operators. The workshop provided a forum to raise awareness among scientists and researchers in the region of the opportunities available for enhancing their ability to respond to the impacts of climate change by exploiting network-enabled collaboration; to establish and strengthen research relationships; and to provide training in network skills and techniques to the network staff from the scientists’ institutions. For more information about the NSRC, visit their website at http://nsrc.org.